It is often necessary to merge multiple sound files into one recording. This need may arise for various reasons: merge ripped CD tracks into one, combine multiple chapters of an audiobook, etc. There are many great programs to achieve this, but very few of them are actually free. I've discovered that while all of these programs perform the task well, they also contain lots of other features, making them too complicated for the tasks. This is why when I needed the plain vanilla merging utility, I could not find one that was free - and decided to write one myself. The added benefit of writing one myself, of course, is that it has exactly the features I need - and none that I don't. When it was done - I decided to give it away for free - to alleviate some of the pains I had. Below are some screenshots of the program. Click on each image for a large picture. 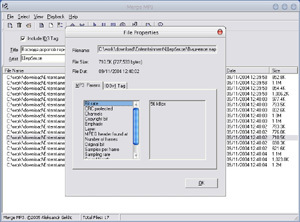 Merge as many files as you like - no limitations by size, length, or number. Optionally write VBR frame into the merged file - useful when merging files with different bitrates. 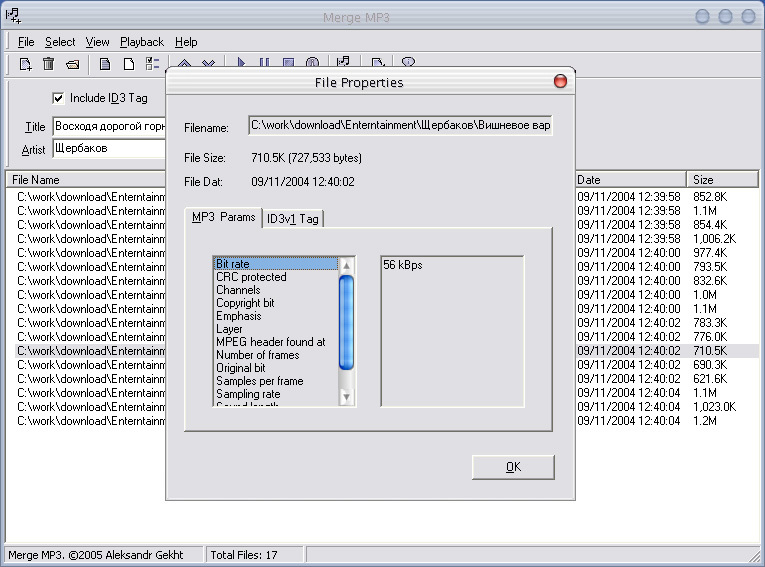 Display an image embedded into the MP3 files. Play MP3 files from the list to be merged. No complicated installation - simply unzip the program and run from any directory. Added the ability to convert merged file into an audiobook format. Fixed a couple of minor UI issues. 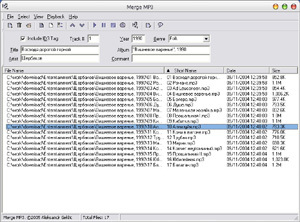 Added the ability to merge only selected files. Added the function to find duplicate files in the list. Added link to the home page. Added check for updates over the internet. 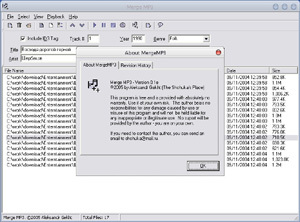 Set 'mp3' as the default extension in file open and save dialog boxes. Fixed a minor bug related to detecting duplicates when adding files to the list. Fixed a bug related to adding multiple files using the dialog box. Major rework of user interface to correctly support unicode file names and ID3 tags. Fixed a bug that in some cases caused duplicate concatenation of files. Added a switch to use MP3 frame or raw stream mode. Added auto detection of whether VBR frame is needed in the merged file. Updated UI to use Windows XP visual styles. Added playback of MP3 files. Added ability to use ID3 tag of any file in the list as the ID3 tag of the merged file. Added extraction and display of embedded APIC images. Fixed issue with extracting ID3v2 tag. Sorted ID3 tag genre drop-down. Added writing ID3v2 tag to the target file along with ID3v1. Changed the way file information is displayed so that another file can be selected while the info box is open; info box is updated automatically. Added ability to write VBR tag when merging files - useful when merging files with different bitrates. Added "File Information" box, displaying MPEG information (bit rate, sampling rate, sound length, etc. ), ID3v1 tag information and ID3v2 tag information. Known issue: in some cases, ID3v2 tag is not extracted correctly. Files to be merged are now displayed with date/time and file size. Files can be sorted by full path, name, date/time and size by clicking on the column headings. Created proper "About" box to replace simple info message. I would like to thank Konrad Windszus for his article MPEG Audio Frame Header, which provided me with an invaluable information about the structure and format of MP3 files. Information about ID3v2 header was obtained from the ID3.org. 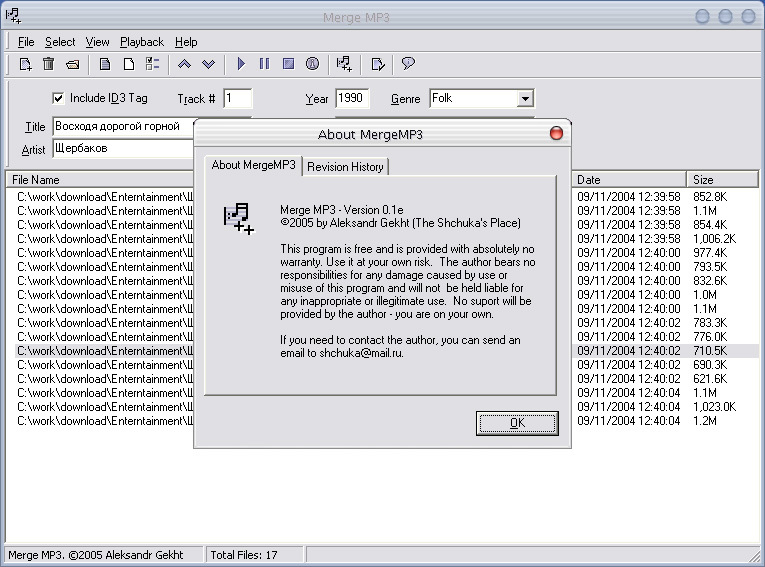 MergeMP3 is Copyright ©2005-2011 by Aleksandr Gekht (The Shchuka's Place). This program is provided to you free of charge and with absolutely no warranty. Use it at your own risk The author bears no responsibilities for any damage caused by the use or misuse of this program and will not be held liable for any inappropriate or illegitimate use. No support will be provided by the author - you are on you own. If you need to contact the author, you can do so here. Download the latest release here. Simply unzip MergeMP3.exe from inside the ZIP file, place it into any directory and execute it. If you liked the program, please consider making a small donation. Any amount, no matter how small, would be greatly appreciated - and will fund development of future versions. All donations are processed via PayPal, which is quick, easy and safe, and you can use any major credit or debit card.